This is my first trip to Peru with Operación San Andres, so there is a lot that is new to me. On Saturday, I first saw the OSA house and we began setting up for the coming week’s Vacation Bible School and health clinics. Then there was a baptism of 5 ladies at Luz de Esperanza church in Collique, which was very moving to me. The baptistry was a plastic inflatable swimming pool, much like you would find in a back yard. 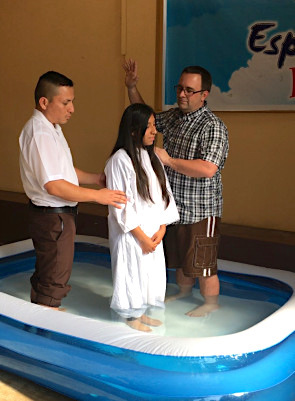 It was evident to me that whether the baptismal pool is elaborate and heated or cold water in a child’s pool makes no difference—the commitment is just as real, and the people being baptized are children of God just like me. Each lady gave a testimony at the end of the service. I was impressed with each of them and it was evident to me that although these sisters in Christ may be among the poorest of the poor economically, they share in the knowledge that by and by they will share in the riches of eternity in the loving arms of Christ. Next Sunday, as I go to worship in our beautiful church with dressy clothes and good shoes on my feet, my thoughts will be in Collique where these wonderful people are walking up the dusty streets to their church family to worship and sing praises to God. And although the circumstances of their lives may be very difficult, their faith is very strong. On Sunday, we worshipped at the Union Church of Lima, and I was reminded again that children of God have many differences but share the most important things in common. What a privilege it is to serve God side by side with many different people. Today, as I began meeting and working with the children who come to the OSA house, I realized that concerns about a language barrier weren’t necessary. I was able to immediately communicate through a shared name, an injured finger, and high fives. When we visited the preschool, all it took for some of the children to feel connected was a big hug. You can always find ways to connect, even with differences in life circumstances, language, culture, or anything else, if you are willing. Sometimes it comes simply through listening, a smile, a hug, or clapping a hand. What a testimony and inspiration the people here are to me! Larry Carroll is a longtime member of South Main Baptist, where he sings in the sanctuary choir, serves on the Finance Committee, and is an honored Deacon. This is his first trip with Operación San Andres.